Anyone who knows me is well aware of my enthusiasm (obsession?) with bubbles. For me, sparkling wine is not merely limited to toasts or apertifs. I will drink it at a bar (providing they have a decent bottle), I will drink it with my entree, I will drink it on a random Tuesday while I'm working on my blog. My friend Laura shares this love, and it's our mutual appreciation that sparked our "Bubbles, Bikes & Baguettes" trip. Originally, we planned to do it while I was still living in SF, but then Laura got pregnant with her second child, so we postponed. And then I moved 3,000 miles away. But never fear! Not even geography could keep us from living out our dreams! Since I was already going to be in SF for a wedding, it actually worked out perfectly. She flew in from San Diego, we met up first thing Sunday morning and headed north to Sonoma. Our first stop was Gloria Ferrer. It was a beautiful sunny day, so we sat out on the patio, overlooking the vines. Our server was super friendly and accommodating. We didn't want a full tasting flight, but we wanted to sample a few of their sparkling wines. He graciously poured us samples of just about everything (free of charge), including glasses that would normally go for $26! He even brought us tortilla espanola (my fave!) after sensing I was a tad hungover from the wedding festivities the previous night. (I may or may not have signed up for the wine club). Little did we know, that was just the beginning of our good fortune during our two-day trip. Up next: phase 2 of our Triple-B trip: Bikes! Our true dream was bikes with baskets (for holding bubbles and baguettes of course), but our bed and breakfast offered free bikes for our use, so we opted for that. 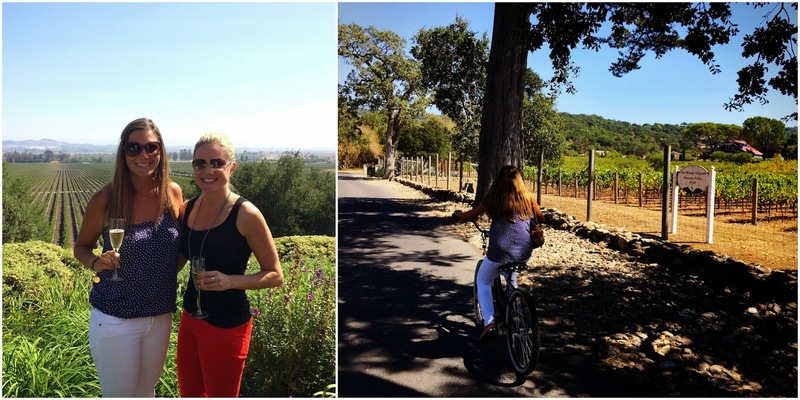 From there, we set off for Buena Vista Winery, leisurely peddling through the Sonoma countryside. 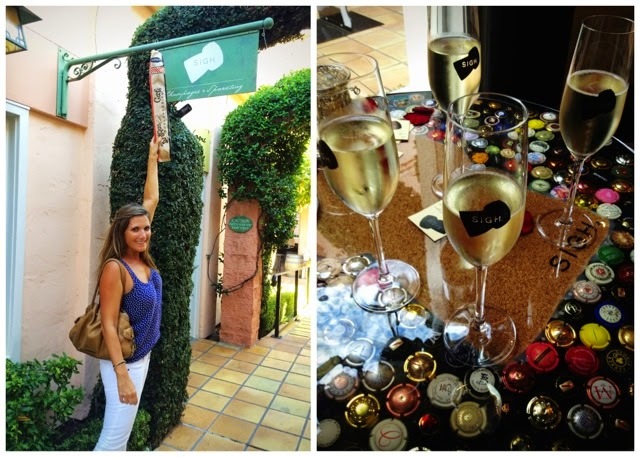 By way of my friend Vanessa, we had arranged a winery tour and bubbles tasting at Buena Vista Winery. It's California's oldest premium winery, and it's located only 2 miles from Sonoma town, so it was the perfect length for a bike ride. 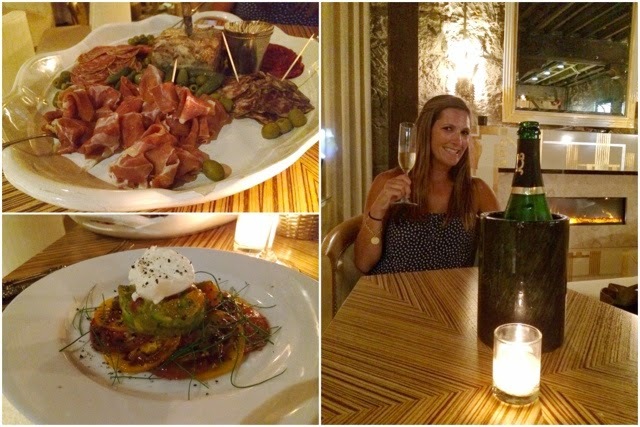 I simply cannot say enough wonderful things about our experience here. Our tour guide, Vic, was super friendly and knowledgeable about the history of the winery. Everyone we met that day went out of their way to make sure we had the absolute best time. That experience culminated when we stopped off in the Bubble Lounge for our tasting of JCB sparkling wines. The lounge is not generally open to the public, and we truly felt like royalty in it. The theme is very much white and gold... with different types of fabrics and textures used in the furniture and tables. Think white fur, white leather, and crystal chandeliers. Not only did Vic pop a bottle of JCB for us to enjoy, but we were also treated to a beautiful (and completely unexpected) lunch. It was compliments of the lovely French chef on hand, who we had made friends with throughout our tour. He was there to cater a large group lunch, but he graciously brought us a (gigantic) platter of house-made charcuterie and a beautiful tomato salad with avocado and house-made burrata. Vic also brought us two decadent cupcakes which had been made by one of the tasting room employees. At one point, another employee, Spencer, came in and started playing the piano, and Laura looked at me and said "Sire... are you proposing?!" Hahahaha. It was pretty romantic. More importantly, Laura tracked down our third B... a baguette!! This came in very handy while soaking up all the alcohol we had consumed, especially since we decided to hit one more winery after Sigh. (As if we needed more wine). However, Roche Winery was a great spot to sit outside and reflect back on our crazy awesome day. As you can see, I had stopped taking photos at this point, which is too bad, because we also had a pair of fabulous entrees at Harvest Moon Cafe for dinner. (Though, we both agreed that this was probably an unnecessary expense, as we could barely finish our food due to our full bellies filled with bubbles and baguettes). Monday morning we set off for Napa to meet up with one of Laura's friends for breakfast and to try our luck getting into Schramsberg Vineyards. Normally, you MUST have a reservation to take the tour, and they generally sell out ahead of time. We attempted calling or trying to register through the website to no avail, so we decided to just try our luck and show up. As you might expect, our good fortune continued. They had two openings on the tour that had just started as soon as we arrived. The cost is steep, at $50, but I can tell you it's totally worth it. 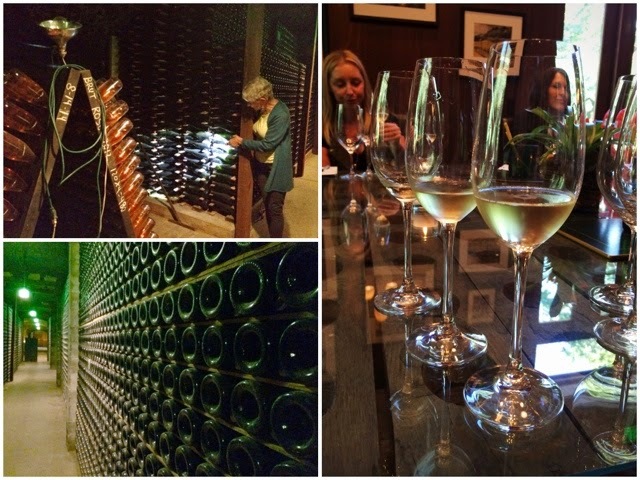 I already had a basic knowledge of champagne making, but Schamsberg really details the history of the winery as well as the method champenoise (or traditional method for making champagne) while taking you on a winding tour through the oldest wine caves in Napa Valley. At the end of the tour, we received a tasting of some of their best wines (many going for over $100 per bottle). We made a quick stop at Frank Family Vineyards for more sparkling, and we somehow scored champagne stoppers (more free stuff!) We then decided to check out Farmstead Restaurant for lunch, based on a recommendation from our wine pourer at Frank Family. Another bonus: while at Frank Family, we bought a bottle of the "Rouge Sparkling Wine" (made from Pinot Noir, and fantastic BTW), and Farmstead waived the corkage fee. This time, we were starving and ready for lunch. 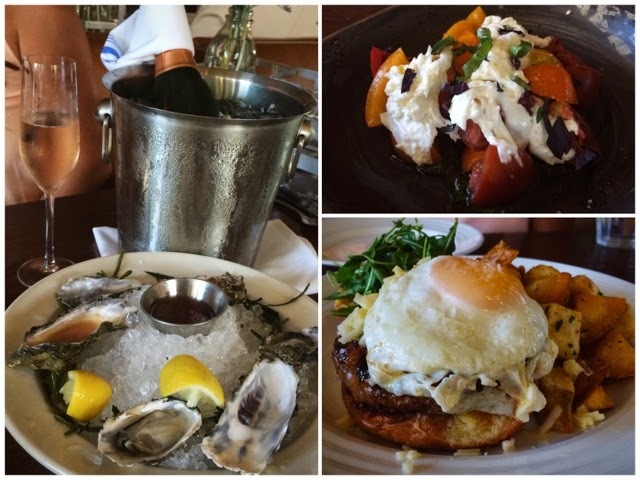 We ordered some oysters with mignonette to pair with our sparkling wine, as well as an heirloom tomato salad with burrata and basil. Annnnnd just because we were two hungry girls, we also ordered the Long Meadow Ranch, grass-fed cheese burger topped with a LMD fried egg. AKA: heaven. And if THAT wasn't enough, we finished off our magical wine country tour across the street with one last VIP tasting at Merryvale Winery, courtesy of Jackie Zink (huge Giants fan, and groundskeeper at AT&T Park) and her colleague Keegan Barrett (Blake Shelton lookalike). We had flights to catch, so sadly our tour ended there. We were bummed to leave, but it just reinforced the fact that there definitely needs to be a BBB part deux, so we can tackle some more of the spots on this list of bubbles in the valley. Thanks to everyone who made this trip so amazing and memorable and cheers to bubbles!! Oooh, I definitely want to check out Sigh now! Loved this post. Altho' I live in the Sacramento area. I haven't visited the wine country for many years (my bad) and this made me put it on my bucket list. Are you allowed to root for the Giants in the WS? Sounds like a ton of fun!! I haven't had a chance to swing back to Sonoma in a while so I definitely got some ideas, haha. What is it about living so close to awesome places that you then take for granted since it is so close that you put off going back to for so long! Thanks for the reminder and noted to take a return trip back soon.